• Try to let Marlin Mudflap™ Teaser Products lay flat in the hot sun for thirty to forty five minutes to become flat again after rolling up or storing. You want Marlin Mudflap™ Teaser products to pull flat as much as possible so they can be seen from deep down below. • Run a heavy duty snap swivel on the front to allow your Marlin Mudflap™ Teaser Products to spin freely. 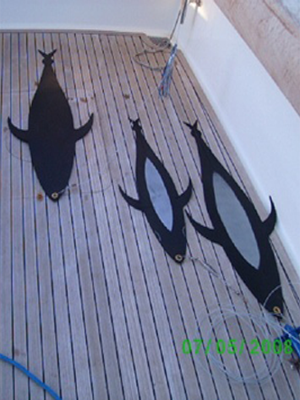 • Lucky 13’s, 18’’, and 24’’Marlin Mudflap™ Tuna Teasers can be ran on a dredge. Just clip on with a snap swivel. They are more effective when ran in greater numbers to mimic a school. • Lucky 13’s, 18’’, 24’’, and 36’’ Marlin Mudflap™ Tuna Teasers work well in a tuna chain and dredge applications. A tuna chain consists of heavy 3-way swivels spaced about twenty four to thirty six inches apart with little six inch droppers off the three way with a snap swivel on the ends to allow the Marlin Mudflap™ Tuna Teaser to spin freely. You can rig as many as you want in a row. • 36’’ or Marlin Mudflap™ Original Teaser can be run solo or tandem using a three way swivel off of the bridge teaser. They pull extremely light for the size of there profile. • Marlin Mudflap™ Teaser products can be ran down deep on bowling pin chains to give them a more erratic action. • Place a Black moldcraft buckwheat lure in front of any size Marlin Mudflap™ for more action. • 48’’ and 60’’ Marlin Mudflap™ Tuna Teasers can be ran solo or tandem with a heavy duty three way swivel. • You can run a bird, islander lures, squid chain ,slant face, or cup face lure in front of a Marlin Mudflap™ Tuna Teaser to give the illusion of a tuna perusing bait .